Welcome to the web home of photos taken by Bill Flaws of Running in the USA. 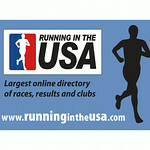 Visit our main website, Running in the USA (www.runningintheusa.com), which is the largest online directory of links to races, results and clubs. Running in the USA is owned and maintained by Mary and Bill Flaws of Waukesha, WIsconsin.